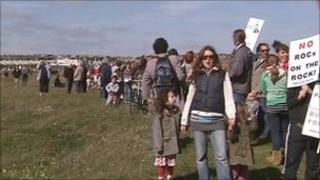 Hundreds of environment protesters have held a rally against plans to build a biofuel power station in Dorset. Campaigners worried about the impact of biofuels on people in South America gathered on Saturday at Portland Port - where the plant could be built. The protest, set up by the group Nope (No Oil Palm Energy), is the third since Weymouth and Portland Borough Council approved the plans in January. W4B, which wants to build the plant, has said it would not use palm oil. It is understood construction of the plant is scheduled to start next year. The march was held in conjunction with Biofuel Watch, Food Not Fuel and The Campaign Against Climate Change. Nope member Andrew Butler said: "The focus will be to get national attention for not only the proposals on Portland but the issue of biofuel in general. "It's something which is really gaining momentum - it started off as a local issue but it is now gaining interest from national organisations." This latest rally comes after a request for a judicial review to look into the decision made by the council was refused by the High Court of Justice. Nope member Robert Palgrave, who brought the legal action, said he was "disappointed" with the result but added: "Even though the judicial review was refused, we are pursuing this." Nope was originally set up in response to fears about palm oil being imported into Portland Port to fuel the plant. W4B has since pledged it will not be using palm oil but has not divulged what fuel will be used instead.